Warfare in the 21st Century necessitates a complete shift in the way we think and the way we fight. More than ever, the use of nonlethal effects is having a profound impact on conflicts. Much of today’s battlefield is in the minds of the public, shaped by the spoken word, cyberspace, media, and other means of strategic communications, as well as by our physical actions. Consequently, melding information with physical operations may very well be decisive in counterinsurgency and other stability operations. 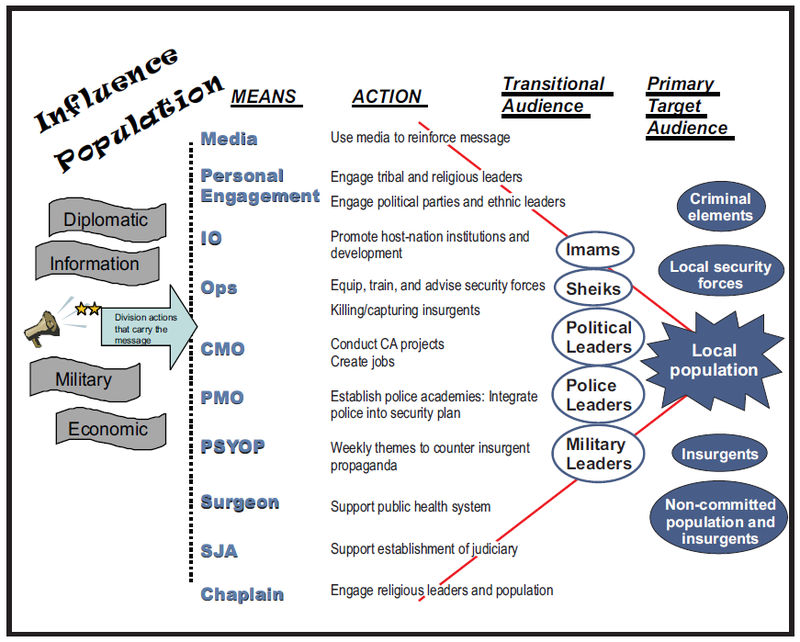 By melding information operations with physical operations, the division commander, who is executing a war against an insurgency and simultaneously attempting to pacify a populace, can gain the respect, compliance, and support of the people who may tip the balance in his favor. The enemy has become adept at all means of communications, in particular information operations, and uses his actions to reinforce his message. As a result, he influences not only the indigenous population but also the world as a whole. We must, as an Army, use all of our resources in a coordinated effort to regain the initiative and become proactive on the 21st Century battlefield. • The ability of the enemy to generate popular support is his center of gravity. • All actions, lethal and nonlethal, impact either positively or negatively on his center of gravity. • Commanders must define a clear end state for their operations and the intermediate goals to achieve it. • The intermediate goals equate to actions and perceptions of the people in the area of operations. • The means of achieving these goals include all lethal and nonlethal means at the Division’s disposal, including key leader personal engagements. 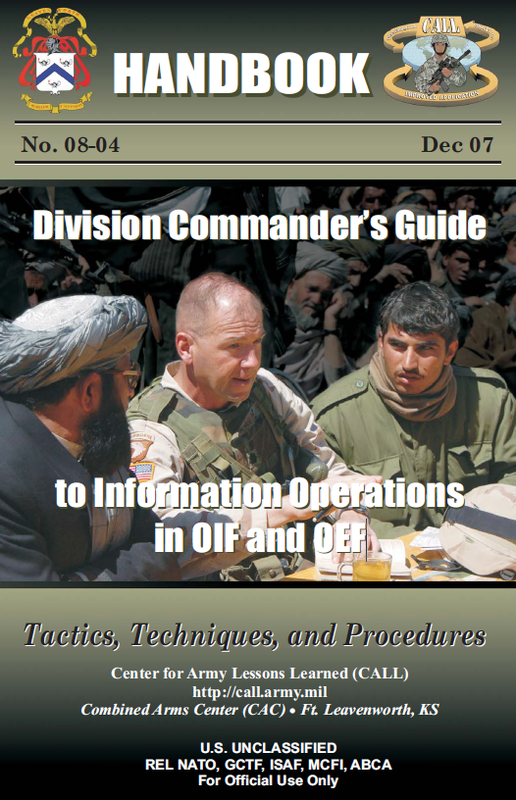 Regaining the initiative in the information fight requires adaptive and creative leaders who can effectively integrate information operations with all the warfighting functions into a seamless plan. The first step is to formulate the desired end state and break it into intermediate goals. In COIN, the desired end state is that the people support the government and withhold support from the insurgents. This is a long-term end state and will not be completely achieved in a single deployment. An aggressive, yet achievable, portion of that end state must be articulated to focus the efforts of the division. The intermediate goals are not necessarily enemy positions to seize or forces to destroy as in military operations of the past. Often these intermediate goals will consist of positive actions by a segment of the society. These positive actions are influenced by their perception of what is in their best long-term interest – it could be supporting a democratic government that allows religious, economic, and political freedom. An intermediate goal could be simply a lack of attacks by the enemy. Any group of people or organized body/cell in the AO can be a target group. The operational art is identifying the intermediate goals that add up to achieving the desired end state. Many methods and tools are available to the commander to achieve the desired end state and to impact target groups. Persuade, deter, convince, empower, confuse, or co-opt are key effects that commanders will try to achieve through lethal and nonlethal actions. Whatever the method, it must build on other actions to reach the desired end state. The fact that some leaders/opinion makers are both targets to be influenced as well as the means the division will use to influence other target groups confuses many. The dual nature of the target can complicate the process when the staff tries to tie the targets to the means used to influence their perceptions and actions. Other factors also affect how key leaders and public opinion perceive actions and their effects. The perception of reality is as important as the reality itself.